How does FilterLOCK reduce my utility bills? FilterLOCK reduces utility costs (heat and cool) by causing return air to be drawn from finished rooms as designed instead of drawn at the open filter slot. What are the main benefits of sealing and covering my filter slot? An open filter slot can allow radon, allergens, dust, and other contaminates to be sucked in and distributed through your duct system. Covering your open filter slot will also reduce your utility bills by helping your heating and cooling system work more efficiently. What filter sizes does FilterLOCK work on? FilterLOCK will fit up to 25” filter slots (1” wide filters). How does FilterLOCK attach to my duct? FilterLOCK has magnets hemmed into the perimeter on both sides and one end to magnetically secure to metal ducts. Does FilterLOCK adjust to various sizes of filters? 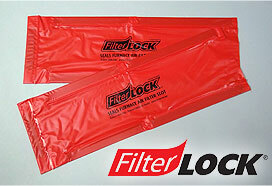 Yes, FilterLOCK is manufactured with an overlapping design to cover various sizes from 10” up to 25”. How does FilterLOCK help improve indoor air quality in my home? FilterLOCK seals the filter slot to cause return air to flow through the duct system and filter as designed instead of bypassing the filter at the open slot. Yes, FilterLOCKs attach and reattach quickly and easily. My filter slot is a little different than shown on the picture. Is it OK if I cut and modify FilterLOCK to fit my configuration? Yes, some slots are configured where one side of the FilterLOCK can not lap over the edge of the duct. FilterLOCK can be cut (through the magnets too) and modified to fit as needed. Will it hurt the FilterLOCK if I write on it? No, many users write a filter change reminder date on FilterLOCK with a felt tipped pen.